So as part of my campaign to rekindle my appreciation of the minis hobby (and spending time at my local after a real blow to the community), I’ve been crafting madly in the last few days. I’ve had a couple games with my Beastmen since the Legions of Chaos dropped (and one more that I’ve not written up, again against the Dwarfs and a pretty decisive victory for the boys in fur) but had thus far resisted adding anything from out of the core codex. I feel that once I start running Warriors of Chaos in my Core, I’ve essentially given up on the Beastmen. Similarly, I’ve got enough points invested in my spellcasters that picking up Heralds or Sorcerers feels unecessary; I’m also not in any great hurry to run more Daemon infantry since that butts up against what I do with my boys in 40k. However, even before it could run in Fantasy I’ve been eyeing the Skull Cannon of Khorne. S8 large blasts that ignore cover solve a lot of problems, even if the armor pen is lacking (so in my space marine-heavy meta, folks’ll be taking 3+’s anyway). The added bonus of letting my Daemons charge through difficult terrain was what originally drew me to it, though my competence in fielding the army has increased to the point that I don’t suffer that as much. I run more flanking units, and 7e gave Daemons of Nurgle defensive grenades, which has given me some favorable matchups. 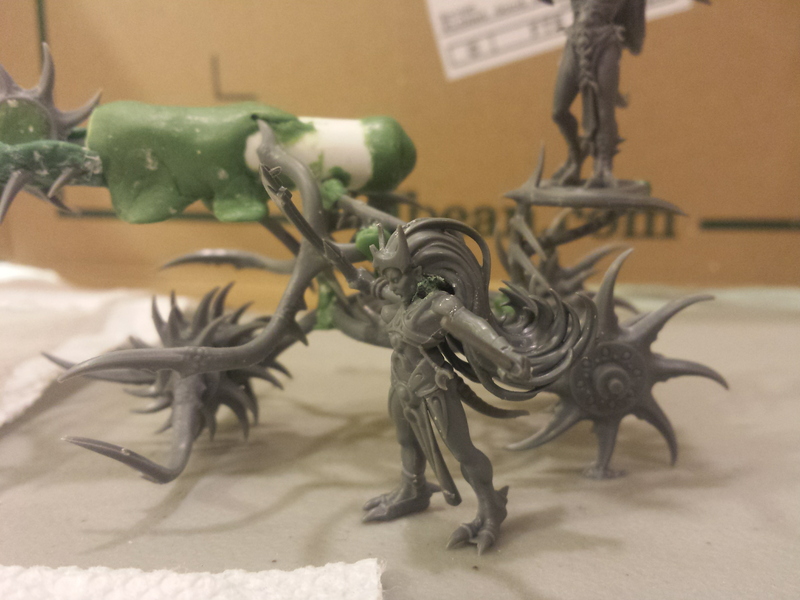 I’m also thinking of adding a CSM Sorcerer of Slaanesh so I can blast folks with the Slaanesh primaris power, which is concussive, blinding, and pinning. Combined with the Noise Marines and their pinning guns, I’ve had an easier time making assault with enough bodies to make a bloody difference. But! The relatively recent FAQ update gave Skull Cannons a crew, so they’re no longer locked into combat and slaughtered after the charge. The changes to vehicle damage tables don’t benefit them all that much, since they’re open-topped, but armor 12’s still nothing to sneeze at and any fire it draws isn’t being directed at my AV 13 Soul Grinders or my juicy Rhinos. So that put me back to planning on building one, using parts of a couple Seeker Chariots I’ve had lying around. The ranged options in my 40k army have increased quite a bit, so long as I’m running allied CSM, but having another Large Blast lets me take at least one of my Grinders with the armor-killer S10 blast. It’s mostly for Fantasy, though. Playing so many games against Dwarven artillery has me really hankering for a long-range response, and the proliferation of Mortarchs and Maggoths and upcoming Verminlords (which, by the hoary hosts of Hoggoth, are some gorgeous models) means I’d like some multiple-wounds attacks beyond hoping to pull the Amber Spear out of the Lore of Beasts. I vacillated between Skull Cannon and Hellcannon, but the latter just feels better. It trades a point of T for a better armor save (and I’ve got no other 3+ armor saves besides my characters), plus heals based off of unsaved Impact Hit wounds (which are resolved at S6, and thus exceedingly likely to score wounds). A couple of Killing Blow-equipped troops stuck into a fight alongside the chariot aren’t bad either. However, I’m not a Khorne guy. Even with my Beastmen largely repping the big K (or the version of him that I’m employing), I wanted something I could swap into 40k when called upon. But only from the front side…not so much a blunt side. He’s painted up now, but this was the picture I had handy. I magnetized the cannon, which is just some plasticard tubing cut with a groove for the sawblade, to which I affixed some of the spiny bits on the chariot. 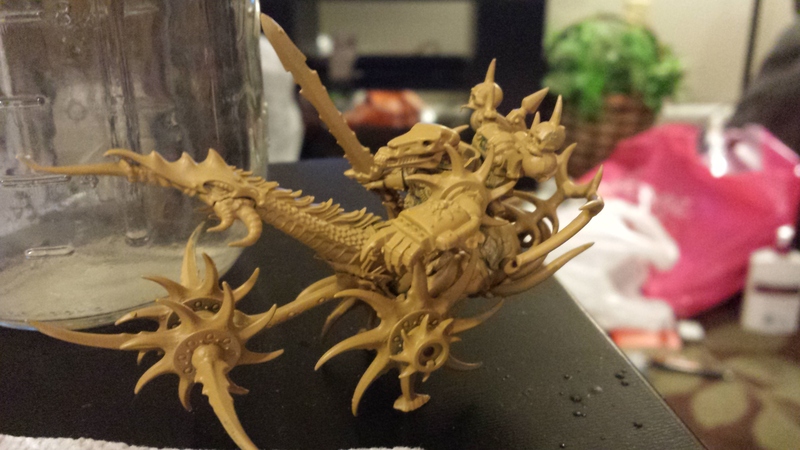 Since I’d apparently misplaced my chariot directions, putting it together required a lot of reference to pictures of the Seeker Chariots on GW’s website. I’m still not entirely sure where a lot of the bits go, but the actual build was material-light enough that I could comfortably make a second one, though it’d lack the second platform. This is the Pimp My Ride shot. The actual chassis was done quickly, and then I just toyed with adding some additional bladey bits. I built a holding frame for the cannon, and spent some time fiddling with the fit as I added and moved greenstuff around the barrel. I’d thought about adding more sawblades, or even cutting most of the spines off of one and slipping it into the cannon, to give the impression that the gun was constantly generating more ammo. Ultimately, though, I decided that I liked it rather minimal. Fascinated by something on the ground. I wanted to be sure that the Daemonettes I used for crew could clearly represent Bloodthirsters, with their AP3/Killing Blow weapons (40k/Fantasy) and higher strength. 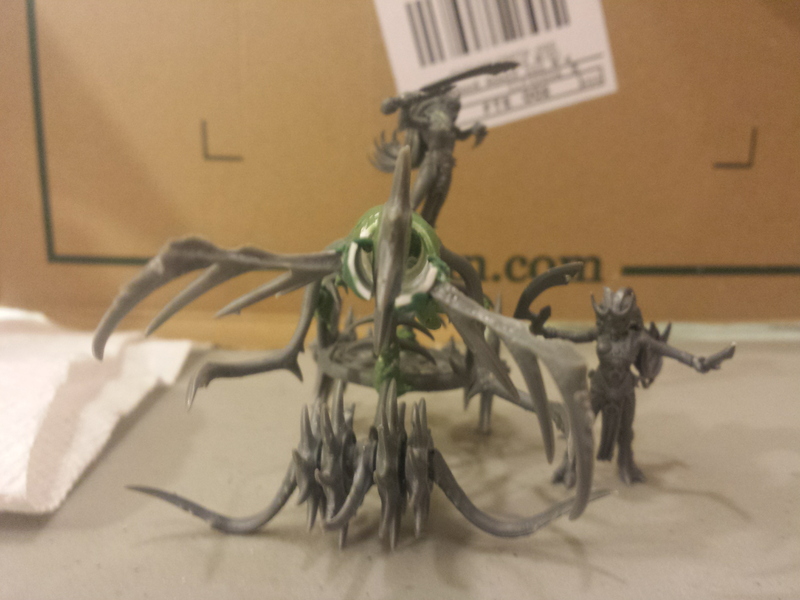 Their bodies are two of the Seeker Chariot crew, their heads are Dark Elf Witch Elves, and I gave each of them a Tomb King skeleton khopesh blade for a weapon. I’m working on priming and painting the crew of my various chariots (including my Tuskgor/Razorgor ones) separately from their vehicles, then gluing them in place. 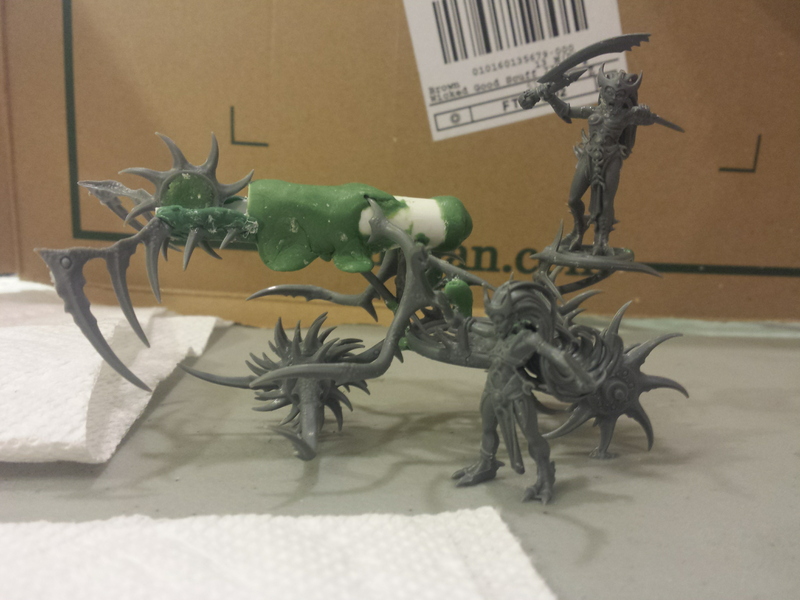 It feels…wrong, but superglue works fine on paint so far as I know, and I’ll still score the contact points. I worked on a couple of other projects too, which I’ll post up when it’s not 4am: beastman harpies and my Batdrake! Posted in Hobby, Warhammer.Tagged Beastmen, Daemons, Kitbashing, Warhammer, Warhammer 40k, Warhammer Fantasy. Next Post Where Do Beastbabies Come From?